I spent another entire weekend cooped up in my house, sick, but at least Dave and I got back to some of our almost-ideal weekend activities: taking the dog to the dog park, picking up morning pastries from Bovine Bakery (I may be addicted to their morning buns), and doing lots and lots of cooking. Besides the chicken soup with chipotle paste for lunch on Saturday, we did Bittman’s onion and parsley roasted chicken on Saturday night, along with this really yummy Brussels sprouts, apple, and bacon hash. Dave roasted the chicken, and as the usual chicken roaster in our house, I have to say that my skin usually gets browner, but he did a good job. When I make that roast chicken variation, I use a mandoline to slice the onions very thin (I also use yellow onions). Dave used a knife to chop his white onions very thin, but the basting mixture ended up being really liquidy. I think that may have affected the crispness. 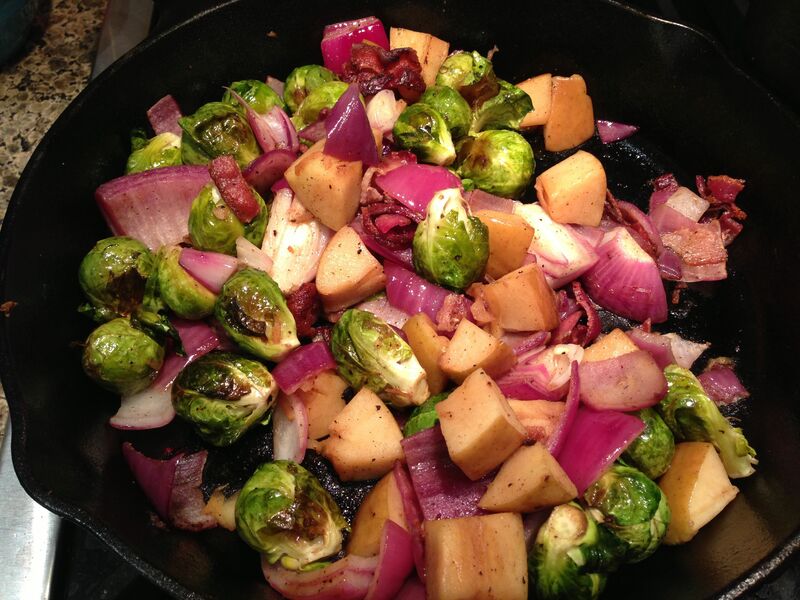 Brussels sprouts, apple, and bacon hash from Martha Stewart Living. Three words: om nom nom. The Brussels sprouts, apple, and bacon hash is from the Jan. 2013 issue of Martha Stewart Living (I am newly obsessed with MSL, which, under editor Pilar Guzman, has once again become a great magazine). It was in an article that basically said that you should roast veggies while you’re cooking something else, and use them later in the week for a side dish. BRILLIANT! We roasted the veggies at the same time as the chicken, which worked out OK time-wise because you don’t need to reheat all the food. However, it did make it harder to cut the onions into small enough bits. The richness of the bacon in the hash worked really nicely with the lightness of the chicken. All in all, a good pairing. Coconut-key lime squares. I burnt the crust at first, then redid it, then messed up the consistency of the filling. Still, the flavor was good and I’d definitely try it again. For 2013, I’m bringing back one of my favorite New Year’s resolutions: trying at least one new recipe every week. But I’m adding a twist to it this year. I’ve been jealous of Dave and how he has a bunch of recipes stored in his head, so another resolution is to revisit at least one old favorite recipe (or, at most, a twist on an old favorite) every week so that I build up a repertoire AND expand my horizons. Today, both to keep up with my resolution and to try to get rid of my relentless and enduring cold, I made chicken soup with chipotle paste, from Mark Bittman’s The Best Recipes in the World. Bittman described it as a smoky soup (thanks to the chipotle paste), so I used the turkey stock we made from our Thanksgiving turkey (smoked on our then-3-day-old Big Green Egg). The smoky stock complemented the chipotles nicely. Mark Bittman’s chicken soup and chipotle paste. Add as much or as little of the paste to the soup to give it kick, but a squeeze of lime juice really helps bring out the flavor. The recipe is super easy — great for a weeknight meal (and then you have leftovers to freeze or eat for lunch). 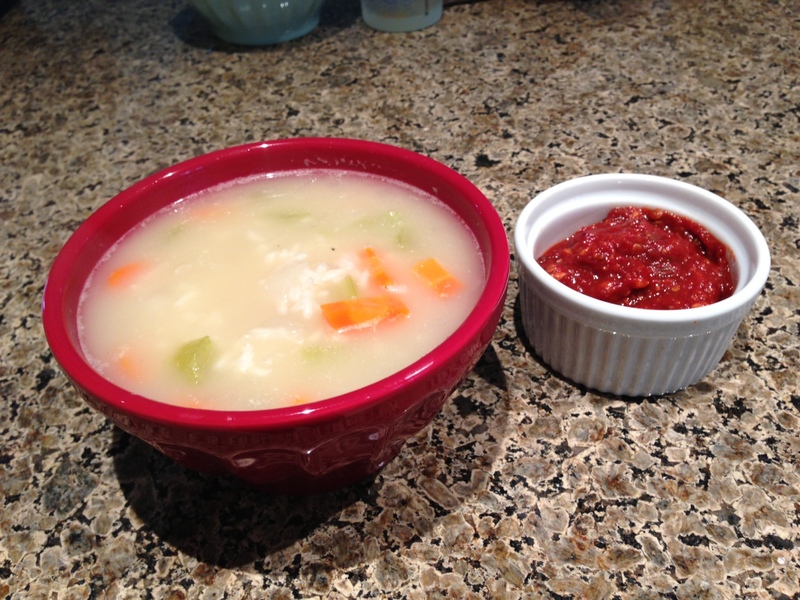 The basic recipe is a plain ol’ chicken and rice soup recipe. Add the chipotle paste (which you make while the soup is cooking), and it’s got just enough kick. “Just enough” because you add it to your own bowl. But squeeze a wedge of lime into it, and all the flavors seem to focus: the spiciness of the peppers is clearer, the smokiness becomes a nice background, and the carrots and celery are a nice little veggie break from the more intense flavors. And, add enough chipotle paste, and it’s a decent sinus-clearer.